Writing is probably the most difficult area for learners to improve on by themselves. Writing demands an audience and if you have no-one to tell you how successful your efforts are – or not – then you are doomed to repeat your failures into eternity. Cambridge English have, however, just released a beta version of an online, browser based writing helper. Currently free to use and requiring only a facebook login (or email registration), the service allows learners to input their answers to one of the five questions provided (or submit a piece of writing of their own choice) and to get feedback on their efforts. In the screenshot above, the highlighted text at the bottom of the image is the submitted text. The colour coding represents the program’s opinion of the learner level the different sections of the text represent. The deeper the green, the closer to B2 level (or above) the text is – the more furious the reds, the closer to B1 level (or below). It’s worth remembering that this is still in the stages of testing and ironing out initial problems – and there are quite a few things that I think need improving! As it stands, the feedback it gives is primarily linguistic and syntactical. In other words it looks at the grammar of the sentences and makes suggestions. And it doesn’t currently catch everything – as in the third sentence above; “I the town you can…” or the fourth sentence “You can go to the shopping”. The text itself was an answer to a question from a Cambridge English Preliminary paper from a student studying at Intermediate level. There is a lot of repetition in the text and very limited grammatical range. The student has also some word choice issues – again there is a lot of repetition (a lot of which is repeated from the input) and some vocabulary inappropriacy. The task was also a letter (replying to a penfriend) and there are a couple of genre features missing, though in fairness to the system – it didn’t know that as this was submitted to the free writing section. Overall though, this is a piece of writing which I think is close to B1 level, but which is nowhere nearly sophisticated enough to achieve B2 level, as the system suggests. I had some fun writing an error strewn letter of application for a summer camp job, just to test whether it does pick up on these things. It doesn’t. So who should use this tool? It’s unfair to judge it too harshly at this stage of development but I don’t think the target audience of B1- B2 are actually the people who should be using it. Students hoping to achieve a B2 certificate need to consider a much wider range of things to improve on and if this tool is to be useful for them, then it needs to more accurately reflect the things they’re being assessed on. 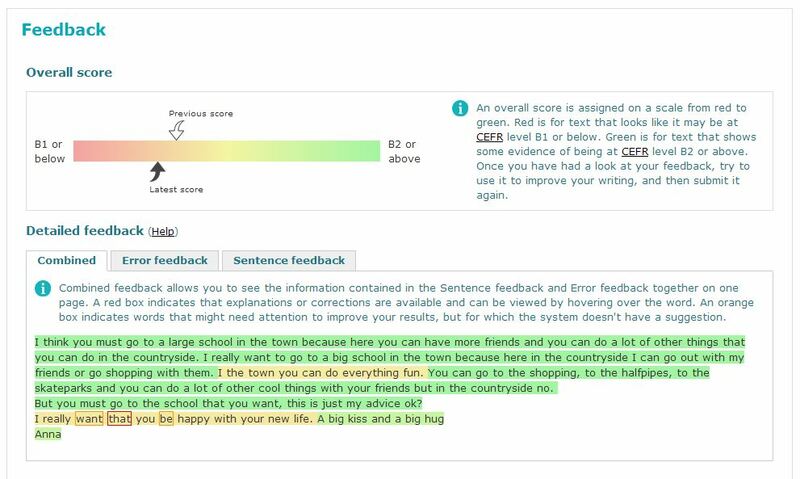 However, I think students who are at B1 level or below may well find it useful, as they will get to see the improvements they make to their texts improve their scores – as long as they don’t mind seeing their work highlighted in quite a lot of red to start with! I really like reading other teachers’ blogs because I come across things I would never otherwise find. And how useful they are! I’m very much week in English writing and also speaking so what should I do to improve my English writing and speaking and one more thing that I already started my ielts classes in s.t Johns but still I’m think I’m very much week then other students please let me informed what should I do ? Some things you could start with are (1) learn the differences between ‘a week’ and the adjective ‘weak’ (= opposite of strong), ‘than’ and ‘then’, the difference between “I think” and “I’m thinking of…”. (2) Use sentences with punctuation and capital letters where appropriate – the above is just one long sentence/paragraph. Good luck. it seems to me interesting .